If you’re not going to the Tour of the Gila bicycle events this weekend in Silver City, NM, consider doing something even more local. On May 2 there is fundraising bicycle ride from Albuquerque to Santa Fe that pays tribute to law enforcement officers in New Mexico that died in the line of duty. 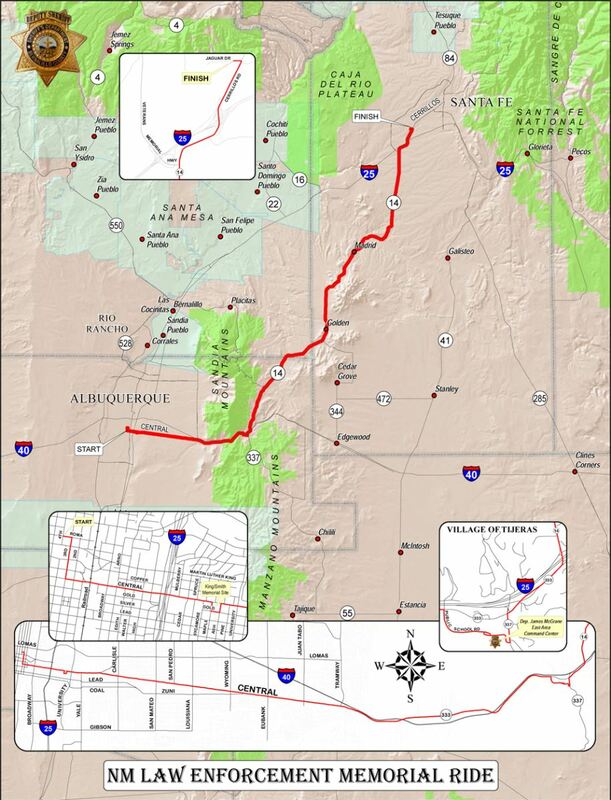 The classic route follows Central Avenue through the heart of Albuquerque, then braids through Tijeras Canyon before turning north where it follows the Turquoise Trail past small villages set in the finest high desert landscape in America on the way to Santa Fe. The journey begins downtown on Central Ave. following old route 66 east. Albuquerque is remaking this corridor into a multimodal transit way with a sleeker bus service called Bus Rapid Transit that brings benefits of light rail. This shift combined with mixed use development can transform neighborhoods, enabling residents and visitors to explore and meet daily needs with greater ease and more good travel choices. What would you like to see as you pedal your way down Central Avenue? Central Ave’s iconic resonance plays a big roll in the regional and American imagination, making it a natural magnet for attracting our talents. With strong transit available people have quality time freed up. Propinquity, the nearness to one another, is one of the advantages of cities. Transit puts this to use. People interacting directly–including incidental and spontaneous meetings while biking, walking, and taking transit–can be productive. Face to face interactions spur innovation and creative economic development. Making it better for people bicycling, walking and riding transit is a positive factor for creating a sustainable sense of place that is healthy and alluring. Welcoming people to enjoy life in an attractive and inviting streetscape makes it exciting and safer for everyone. A new era is beginning to take shape on Central. 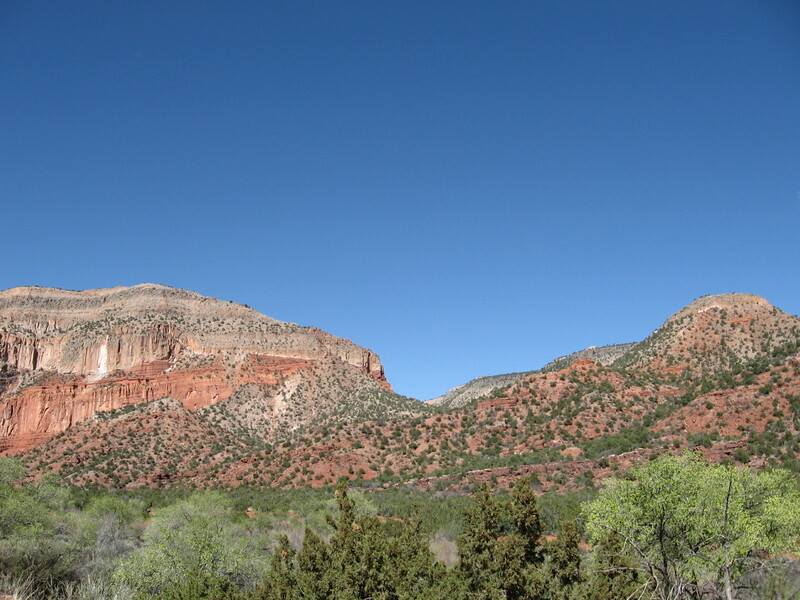 Leaving New Mexico’s largest city, the transition from the open plains of the middle Río Grande into winding Tijeras Canyon immerses the riders in a geologic wonderland folded between the areas two largest mountain ranges, the Sandias and Manzanos. Six miles later riders emerge on the other side in a piñon juniper forestland and the Village of Tijeras. As you go north this charming desert landscape opens up with enormous vistas across the Río Grande valley to the Jemez Mountains. The small towns you pass through along the way such as Madrid and Golden display unique character. The pine speckled hills of the Ortiz Mountains lend stunning intimacy and great depth. This is a one good way to pay tribute to the sacrifice and service of New Mexico’s finest and open up our hearts to celebrate our way of life, and to say thank you. 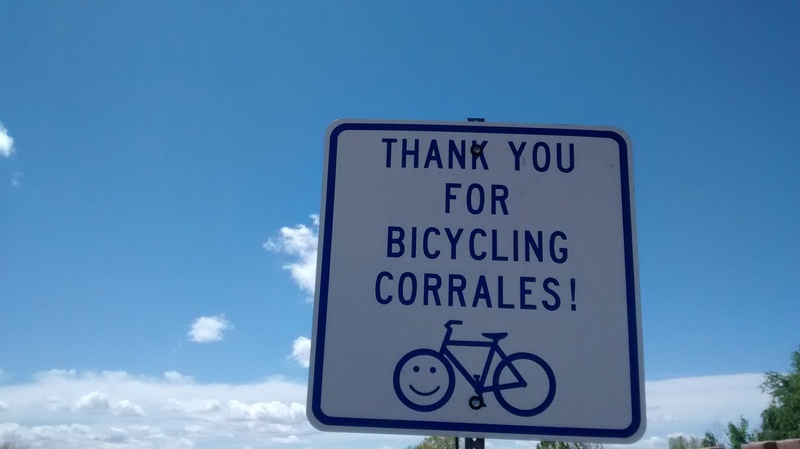 This entry was posted in Albuquerque Bike Culture, bicycle rides, civil rights on April 28, 2015 by bikeyogiblog. Dr. Eric Marcotte is inspiring. My friend said Eric is “much better than Lance Armstrong. Eric is not just a cyclist, he’s a professional health care provider, too.” Eric focuses his chiropractic work on helping his patients achieve wellness, and helps them work towards their goals. 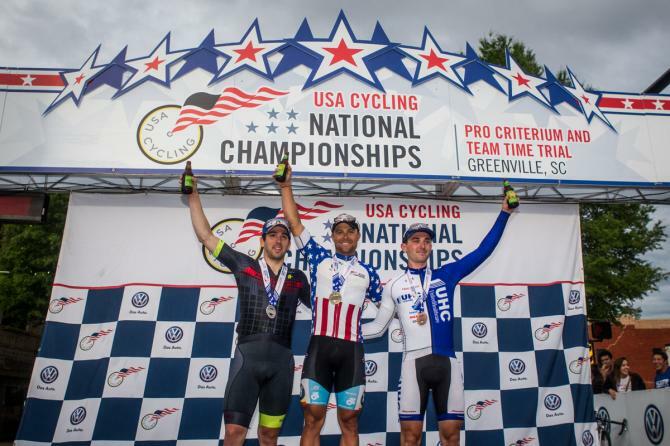 And in his career as a professional cyclist, he has accomplished something that has never been done before by winning the US Criterium National Championship while being the reigning US Road National Champion. Eric, who lives and trains here in the Southwest United States, seems to have removed any self imposed barriers to success. He’s a living example of how an overall life of health and wellness make us better. And that there’s a reciprocity at work in our giving. 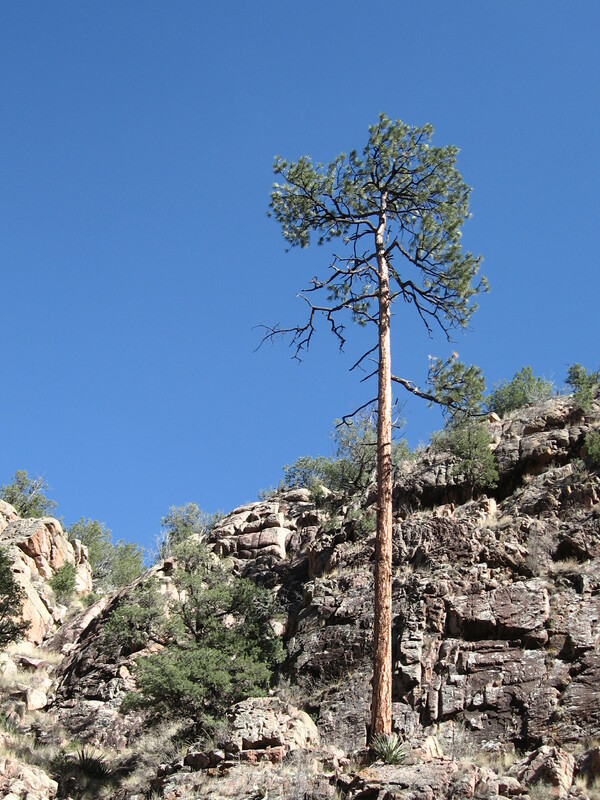 When Eric trained at altitude in Flagstaff the thing that stood out was how hard he worked. The group would be cruising back to town after 60 miles of fast paced riding, but Eric was putting in some more sprints, and he also was up early putting in an hour and a half of riding in the morning prior to when we began. People sometimes envy successful athletes, but watching Eric train I realized it took superior dedication and sacrifice to ride at his level. I admire him for his hard work. He also made a great teammate in Travis McCabe. They lift each other’s game, and stay motivated and centered. Eric seems to grow stronger from sharing his wealth of knowledge on healthy living and healing, and through inviting others to join him in the practice of holistic, responsible, and balanced health. The complete cyclist is a complete person. Dr. Marcotte is proof that through the application of intelligence and motivation we can make a difference. We have to dedicate ourselves to constant improvement, enjoy each step, and keep moving forward. Who knows what we can accomplish. Congratulations Dr. Eric D. Marcotte. This entry was posted in bike culture, digital humanities, exploring by bike, healthy roads on April 21, 2015 by bikeyogiblog. On Sunday morning I like to venture outside on a bicycle ride. This morning Mai, my wife, and I are going out together. This makes it double paradise. On recent rides I’ve been keeping it simple and leaving my camera behind. But sometimes I can’t resist trying to record what I see, so I pull out my cellphone camera from its Ziploc bag in my back pocket, and take pictures. This week I noticed the first cacti flowers opening up to the sunshine. I like cycling because it immerses me in the world. The aim is not to conquer the world, but get a feel for it. I feel excited because every time I pedal I extend my understanding. But I’m always humbled at my small place and the limits of my knowledge. In a way this is scary, to know I’m at the mercy of forces larger than me, but centering, since I only need to manage my small part. I am awestruck by the size and scale of this landscape here surrounding Albuquerque, New Mexico. It is good to feel like a kid in this regard. Walter Isaacson says Albert Einstein’s genius depended on this wondrous sense of the world. Beethoven’s sense of mystery came through in his music even though it was written with mathematical precision. Sensing awesomeness does not necessarily mean you will produce works of influence, but it keeps us excited about life, and makes it possible that we may add meaning to the world by fusing poetic imagination with scientific or practical rigor. We should try to feel and describe it, realizing that being awestruck is only one part. We are obligated to apply our intelligence and abilities in a studious fashion. the cell phone camera did not focus but it came out like an expressionistic painting. All the different Spring greens! I’m amazed at the tilt of the Sandia Mountains and the long line of the alluvial fan skirting down from the mountain toward the river shore. I close my eyes and imagine the whole river system, all 1,896 miles of it. The fresh snowmelt from Colroado’s La Garita Mountains, and all the white peaks above those small towns in the San Luis Valley, places like Mosca, Blanca, La Jara and Crestone. I see the river slipping southward with a quiet gushing through the narrow volcanic chasms below the enormous high mountain peaks and the broad desert plateaus Sagebrush and Juniper roots in, where rabbits, coyotes and deer make their home. 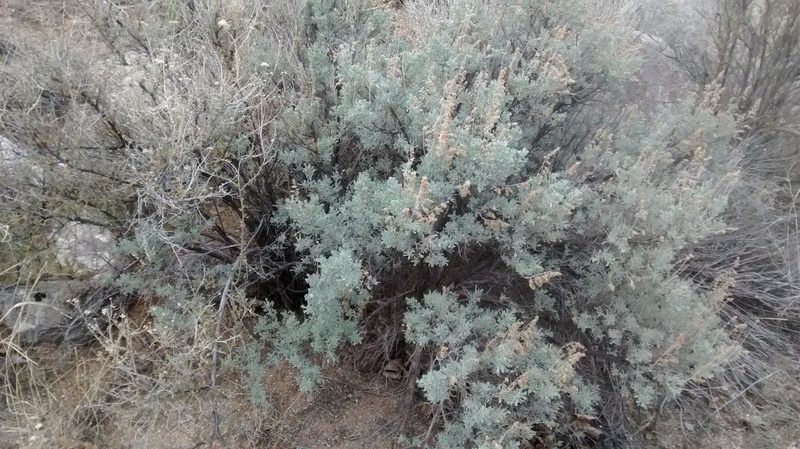 I became accustomed to Artemisia Tridentata in the Great Basin. I love sagebrush, and they live here. 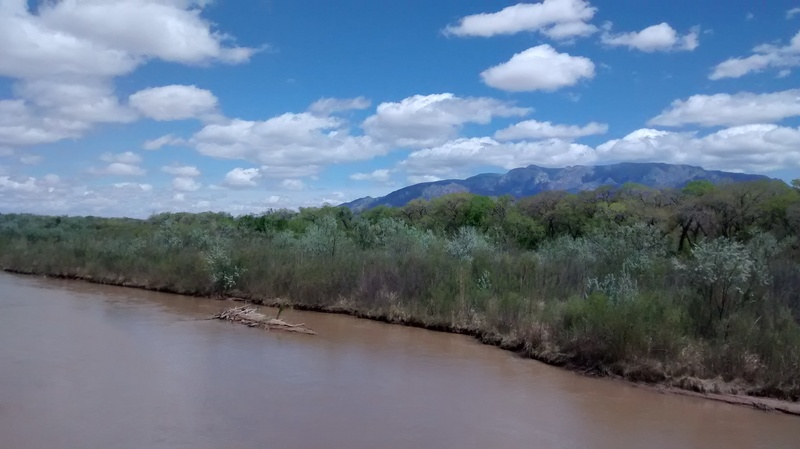 The Rio Grande flows past more small villages north of here. There is small scale farming where possible in the valleys below the high mountains. In these parts luminous stars in the night sky clearly out number TV’s. 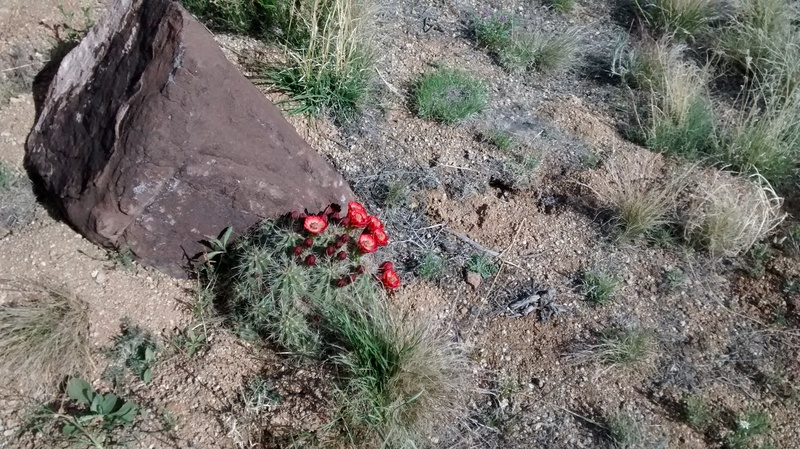 Elk bugle wildly in the fall, and you can see bighorn sheep skylighted on rocky outcrops. 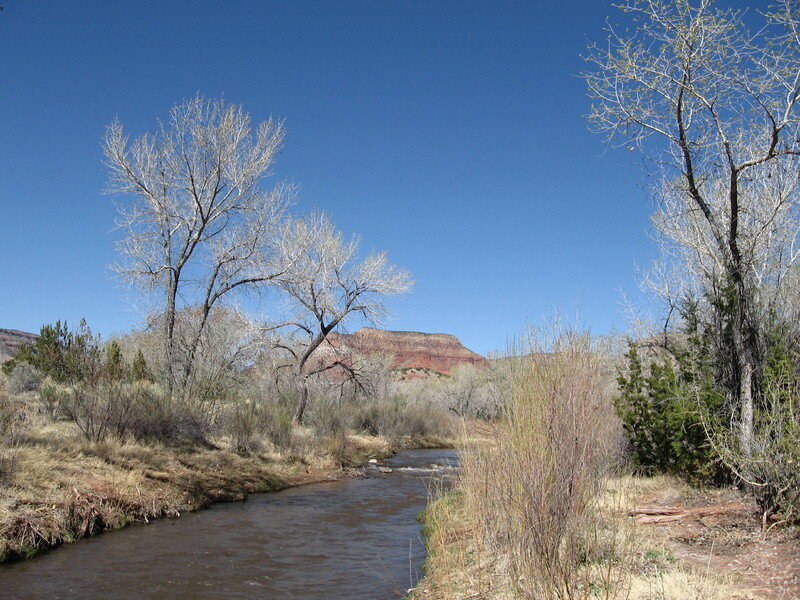 The river flows past the State capital in Santa Fe, and gravity keeps it flowing all the way through New Mexico onward to Mexico and Texas on its long journey to the ocean. Corrales is a farming village on the river. Local merchants organize a winery bike tour. I saw lots of riders out yesterday. I bicycle on Sunday morning to touch base with all of this, and to do the same thing Wendall Berry says local farmers, and the Land Institute in Kansas, sets out to do: “They are interested merely in improving our fundamental relationship to the earth, changing the kind of roots we put down and deepening the depth we put them down to….Harmony between our human economy and natural world–local adaptation–is a perfection we will never finally achieve but must continuously try for.” Bicycling keeps me busy trying, and summons up something inside of me that reminds me why life is humbling yet worth striving at every day. Instead of reducing the world, it expands my sense of it. It guides my work and gives me a wellspring to draw from. This entry was posted in Everyday Rides, exploring by bike on April 19, 2015 by bikeyogiblog. I like cycling. I do it for every reason, including meeting more cyclists. My cycling world keeps expanding. I began for economic efficiency and got into touring, racing, and advocacy. The diversity and relevance in cycling are beautiful aspects. People cycling represent the full spectrum in the American continuum. I leapt into advocacy a couple years ago when I decided I could achieve more with my pedaling by combining it with another dimension. This has been a most rewarding new journey in my cycling life and has proven to me the cycling community is strengthening by being open, welcoming and growing more diverse. Being open minded does not come easily. It means challenging the worldview that we thought we knew, and dissolving stereotypical thinking. It involves being with people who are not exactly like us. Learning involves humility, and shifting our perceptions. But it connects us to a more colorful world. One that coheres, in part, through our participation. We are those connective bonds. We are the greeters opening the doorways. Diversity sparks inspiration, imagination and inventiveness. 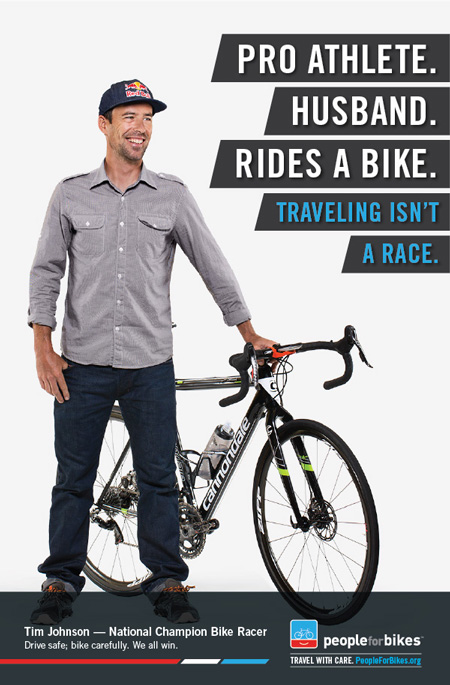 Tim Johnson, a former pro racing cyclist, is a leader in this regard. He knows bicycling needs to be attractive and accommodate a wide range of people, including families that want to cycle together. People in every place from every walk of life. So Tim started organizing rides and learning about advocacy efforts that were helping to remove barriers so more people could begin cycling. Advocacy organizations are enlisting more racers as roll models, much as advertisers do with athletes from other sports. The advocacy movement realizes high level champions like Tim can help build up cycling friendliness across the country and welcome more people in. Racers are people to look to when we study the beauty of the human form, the pursuit of achievement, the quest to fulfill our potential and to see what is possible when we reach toward the sky. It is a more interesting table to sit at, or ride to join, when more diversity is present. We bring our differently developed skills and collaborate to promote the joys and benefits in cycling for everyone and advance people by moving cyclists forward together. A multipurpose ride is exponentially more fun. Both roles, racer and advocate, require tenacity, an indomitable spirit, effort behind the scenes that goes unnoticed, sacrifice of time and resources, long term commitment and dedication. Racers and advocates appreciate this. Both activities are team oriented. The first step towards collaboration is the simple orientation of wanting to help. When we try something new we discover there’s more to us than we even knew. Things we never imagined doing, like writing or public speaking, become naturalized skills developed in the march to larger goals. We find out there is more than one way to make a difference in the world. Readying for the next opportunity adds a new dimension of fulfillment in life. This entry was posted in digital humanities, education on April 17, 2015 by bikeyogiblog. “Americans have demonstrated that when we have greater access to safe infrastructure for walking or bicycling, we are eager to enjoy the health benefits, cost savings, and pleasure of walking or riding through our communities.” –Action Plan on Bike and Pedestrian Safety, Federal DOT (Department of Transportation), September 2014, updated January 22, 2015. We all know it is good for us to walk or bike to get to our destination but the idea that we might not be as safe as we want to be while doing so can pose a significant barrier to exercising this option. Good news, there is conversation, planning and action happening at every level for making travel by walking and biking more comfortable, easier and safer for everyone. There are some excellent resources from the Federal DOT Secretary Anthony Foxx. The Secretary’s Action Plan on Bike and Pedestrian Safety details strategies for “continual improvements” focusing on changes that can have “lasting impacts” on encouraging more walking, biking and transit travel. It has a little something for everybody, from research on protected bike lanes, to transportation implementation measures for increasing “equality, bringing people together, expanding the middle class, and helping people who are trying to get into the middle class.” Locally, the Action Plan is being used to guide an assessment of bicycling and walking safety along New Mexico Hwy 313 through the Sandia Pueblo. I’ll be participating in that study. I would highly recommend taking a look at this Action Plan when you have time. It is aspirational and inspirational, and shows how the pool of talented transportation professionals shifting their focus onto walking and biking issues is growing. A Resident’s Guide for Creating Safer Communities for Walking and Biking is another excellent resource. It includes resources for ordinary citizens and local organizations seeking to develop grass roots initiatives and organize local communities. The Resident’s Guide provides guidelines for developing better preparedness for safe and healthy interactions in our public transportation environment. This is a great connective resource that shows government is working as designed, and functioning to empower ordinary citizens to shape the world based on how we act in our daily lives. With the DOT offering resources and tools like these, and the Mayor’s Challenge connecting at the city level working for safer people through safer streets, we have a comprehensive strategy for constant improvement and coordinated efficiency to address this common ground concern for human dignity and life that will save us money, strengthen our country, save lives and improve our life together. This is a good effort to be a part of. “We’ll only come here if we can have our location by that [walk and bike] trail.” –Anthony Foxx’s anecdote about the city of Indianapolis competing for a new business. The business said they’d come, and the selling point was proximity to good walking and bicycling. 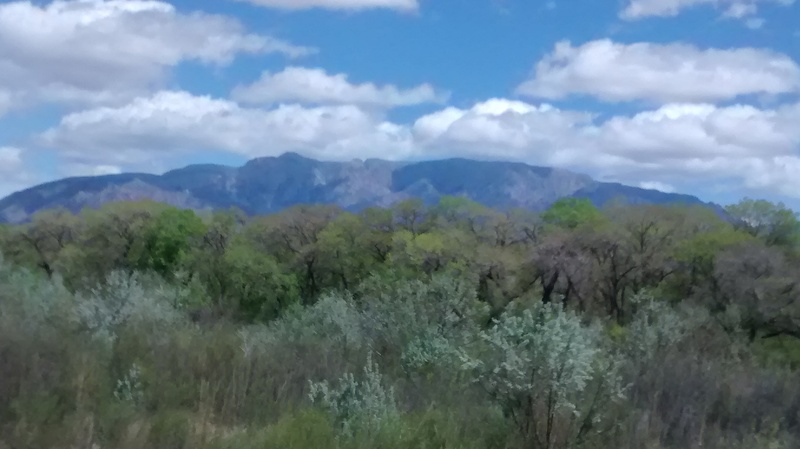 This entry was posted in ABQ bikeways planning, Bike Sense = Design & Education, community news, healthy roads, initiatives, planning, Walking on April 15, 2015 by bikeyogiblog. Three races in two days. That’ll make your legs tired. These images and more are available at Sansai Studio. Mai from Sansai has road race and time trial photos available now and says the criterium photos are forthcoming, pending on getting her regular job and the taxes done. We are athletes. Being active helps us learn. 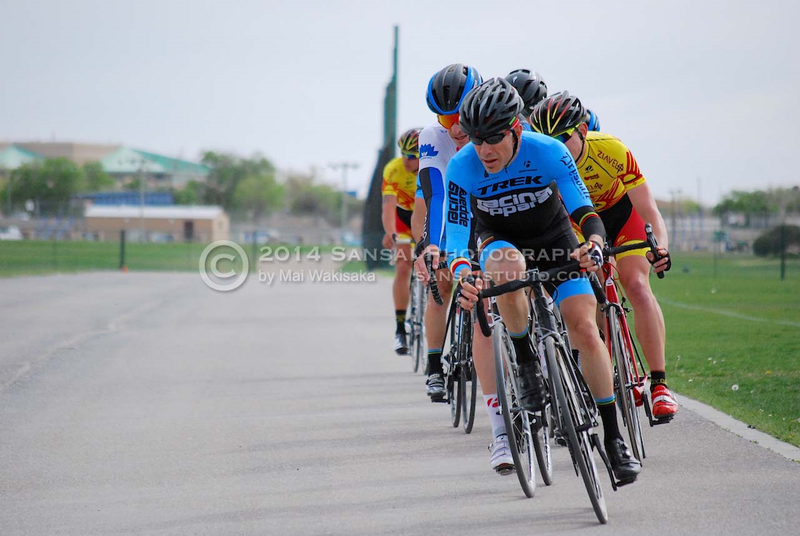 I viewed this weekend’s event as a training race to get into the swing of things again. 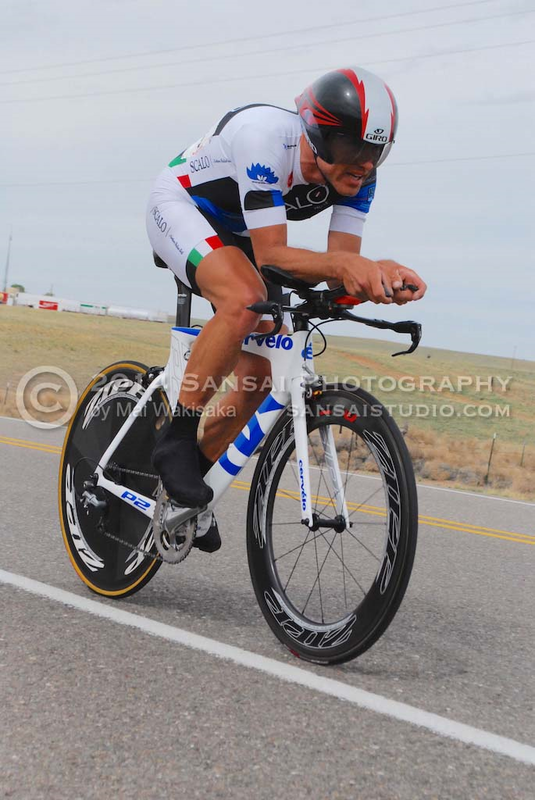 It built up my motivation and gave me a sense of how strong the racing is in the Southwest US. The event showcased fit and healthy athletes and brings bicycling to the broader public. People race to reach for pinnacle experiences, to execute teamwork (road cycling is a team based sport), to build community, and to have fun enjoying the bounty of all the hard work that goes into practicing bicycling. Since we live in Albuquerque it was a special treat to race from home. There was a little driving involved to each venue, and I got a little bummed out spending Sunday morning on the freeway heading over to the West Side, and Sunday afternoon on the freeway again heading over to the north side. When you’re driving on the freeway major landmarks like the Rio Grande are a quick blip on a high speed journey, or you may not even notice the river at all. But when I climbed out of the car and onto my bicycle I felt grounded again knowing exactly where I was. The driving was not too bad considering races such as Valley of the Sun in Phoenix, which requires 50 or 60 miles of serpentine freeways between stages. I’m spoiled because in my regular life I don’t have to drive a car. I can use my bicycle and transit for everything, as Albuquerque is a city especially scalable by bicycle, and my favorite place to drive my bike in. 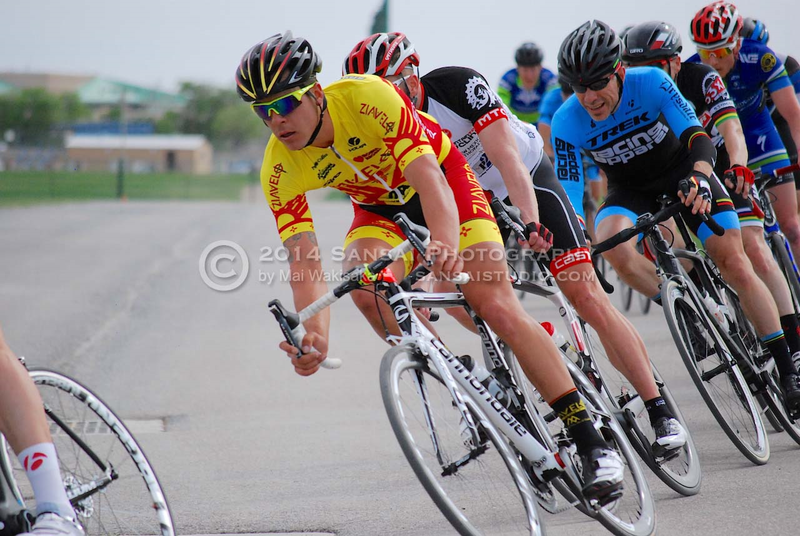 Thanks to Sports Systems Mountain Top Cycling on Montgomery and Louisiana for a wonderful weekend of racing. Please remember to support the beneficiary of this race, the Adoption Exchange, by helping them find waiting children safe, loving, and permanent homes. I’ll see you next time at the races, or perhaps we’ll meet before then somewhere out on the road or trails. 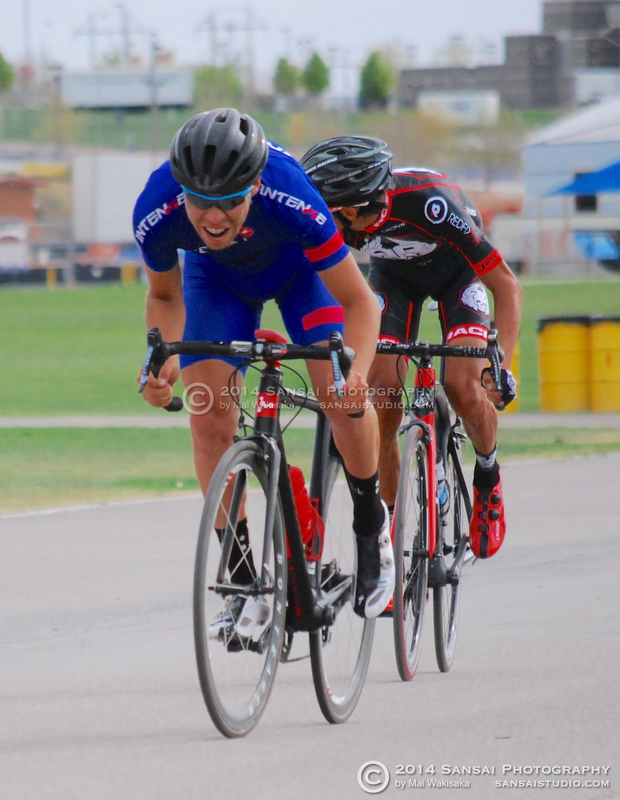 This entry was posted in Albuquerque Bike Culture, race report, training on April 13, 2015 by bikeyogiblog. This year is the centennial of the founding of the Ecological Society of America. The ESA is an organization based on the principles articulated by an American prophet of ecological relationships, Aldo Leopold. Leopold grounded his science in a system of interdependent and reciprocal relationships. He called for a land ethic that encouraged people “to see land as a whole…to think in terms of community rather than group welfare, and in terms of the long as well as the short view.” The “land ethic simply enlarges the boundaries of the community.” Leopold would not see landscape as scenery, but something we are a part of. Leopold’s ideas are so strong, fundamental, and universal his principles easily apply to bicycling. I think of the public road environment as its own ecosystem, a microcosm of the world we live in, one that supports human life. The bicycle not only preserves the integrity of the street life but it enhances it with a fitting human presence. There is nothing more pleasing than to be with happy people, especially in health promoting surroundings. The bicycle’s simple technology is perfectly adapted to amplify human powers but not so much that we get the illusion we are removed from the sense our welfare is dependent on that of the whole. The bicycle promotes an ethical relationship to the land, our communities, and our bodies, every thing we need to perceive the truth of what underlies the health of both culture and land. We are at a time in the development of this nation when we need the bicycle. It is at the confluence of our struggles to create healthier weights and lifestyles, transition to more neutral energy sources, conserve the inheritance of fossil fuels and fossil water for a time span longer than 50 years out, extend the benefits of civilization consistently, and fulfill the promise of respecting and uplifting every individual’s dignity. The bicycle is something I can pick up every day that grounds me in a productive process. It helps me do today what I think needs to be done for the future. I want to thank the Mr. Leopold and the ESA, the bike planners and engineers who have created the parts of the transportation system that encourage good bicycling now, and especially the practicing bicyclists out riding growing that ethical sense that people belong on the land through living acts of remembering what supports us. Bicycling can be a fulcrum, a pivot point, our whole world can turn on. http://esa.org/baltimore/ Ecology seems to me the central science because it is based on relationships, interactions, and the functions at the interface of phenomena coming together. It is important to note ecological science is nascent. Imagine how much we have to learn. http://www.aldoleopold.org/AldoLeopold/leopold_bio.shtml Aldo Leopold showed the force and power of espousing original principles and ideas and advanced American life in a manner similar to Ralph Waldo Emerson. http://yalebooks.com/book.asp?isbn=9780300190380 Wilderness and American Mind by Roderick Nash is a great source book for discovering the America we thought we left behind. The quotes in the first paragraph are from Nash, 3rd edition, page 196-197, quoting from Leopold’s essays “The Ecological Conscience” published in the The Bulletin of the Garden Club of America, 46 (1947) and “The Conservation Ethic” published in Journal of Forestry, 31 (1933). This entry was posted in Bicycling Ecologies, digital humanities, healthy roads on April 12, 2015 by bikeyogiblog.